No person has taught me more about what spiritual formation is and should be than Dallas Willard, a remarkable teacher, writer, thinker, and disciple of Jesus. We lost Dallas last week, and for me and so many others it is difficult to conceive of a world without his great influence. Although I had only a very slight professional acquaintance with him, he was and will continue to be a great mentor to me and countless others through his books and other teachings. Particularly valuable to me have been Dallas’s teachings about spiritual formation, in books such as The Divine Conspiracy and The Great Omission, as well as Hearing God and The Spirit of the Disciplines. Here are some of the life-changing teachings I have learned from him. 1. Someone is my teacher. Through his writings, Dallas taught me always to keep asking, “Who is my teacher?” I am always learning from someone, often many someones, and those teachers are shaping me into a student like them. So it matters what I read, who I spend time with, even what I watch on TV. In the end, there is only one master teacher to follow, one teacher that I want to be just like, and that’s Jesus. 2. Being a Christian isn’t just some kind of promise for later; it’s about a process of transformation into a person like Jesus, a journey you can begin NOW. When I became a Christian as a young teenager, I didn’t really understand that I was setting myself upon a path to become more like Jesus. I believed, yes. I believed that God made me, that Jesus died for me, that God loved me, and that I wanted to accept God’s love and Jesus’ sacrifice, that I wanted to confess and be forgiven, to receive eternal life. I was thinking more about the next life than this one. As for impact on my own life, I thought of it as Dallas and C. S. Lewis describe, “as hearing what Christ said long ago and ‘trying to carry it out. '” (The Divine Conspiracy, p. 21). And frankly, just “trying” to carry out what Jesus said didn’t ever work all that well for me. Despite all the biblical references to a process of transformation, of becoming more like Jesus in the Bible, I’m not sure I ever really believed that I could be like Jesus. But Dallas explains that EVERYONE is invited to be a disciple, that it is not just some kind of extra credit option for over-achiever Christians, but that we are all meant literally to study with Jesus, to transform with his guidance to the point where, as Dallas puts it, “we are able to do the good we intend” (The Great Omission, p. 15). 3. I am a disciple of Jesus. Jesus’ followers were “disciples.” Above all, they were people who dropped everything to follow Jesus because they wanted to learn from him, to study, observe, and emulate him. In The Great Omission, Dallas defines “disciple” as “a learner, a student, an apprentice—a practitioner, even if only a beginner” (p. xi). Thus, following Jesus is not just about what you believe, but what you do. Following Jesus means recognizing him as my teacher—studying all of his teachings, and also seeking to do what he did, most obviously the practices he showed us in the Bible: prayer, fasting, solitude, silence, worship, and study, to name a few. Truly Jesus came to show us how to be human. The most important element of this discipleship process is simply trusting Jesus. 4. I have a role in God’s kingdom work. We undertake this process because we have work to do, here in the world. How humbling it is to think God has a role just for me. For too long I never thought at all about what the point was for me to be a Christian, a Christ follower, in this life, why it mattered. I had long been dismayed in school when studying Christian movements that taught that this life was just something to be gotten through, a painful waystation on the road to our true existence. Yet I believed a version of the very same thing by not fully understanding that the point of following Christ was to become more like Jesus so I could better participate in God’s work in the world. God’s kingdom is vast and expansive, but we all have our kingdoms over which we hold dominion. Dallas defines each person’s kingdom as “the range of our effective will” (DC, p. 21). For those of us who are parents, our kingdoms most certainly include our families. We must learn to blend our kingdoms with those of the members of our family, and that’s no easy task. When we are serious about this apprenticeship business, we are saying that we want to work with God, to bring God’s influence into all the nooks and crannies of our kingdoms, even when we’re not entirely sure we want the change that will entail. Dallas is filled entirely with Zoe now, and I rejoice for that. And even as I mourn the loss of his calm, assured, and scholarly voice and the hole his passing has left in the lives of his students and loved ones, I remain ever grateful for the illumination he shined into so many areas of this with-God life. What have you learned from the teachings of Dallas Willard? 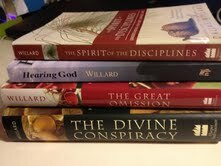 Tags: books, christian, Dallas Willard, discipleship, Jesus, spiritual disciplines, spiritual formation, spiritual practices. Bookmark the permalink. Previous post ← Thin Places: I can feel the winds of heaven . . .